At Marys Flooring you can get the look of unusable and beautiful hardwoods from around the world. 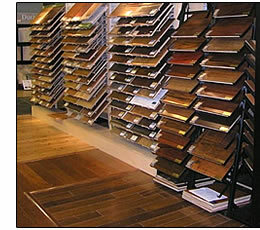 We have the great selection of hardwoods from the richly-grained exotic woods to the classic North American hardwoods. Our hardwood flooring come from some of the finest flooring manufacturers and have the tough, durable finishes that will last for many years. No matter what your taste or décor we can help you find the right hardwood floor to meet your budget and add beauty and charm to any room. We offer everything from the hot hand scraped woods, to 3/4" solids to the engineered hardwoods that can be used through your home. Reliable service and expert installation are our trademark! Hardwood flooring is a big investment and our expert sales staff can help make sure you get the right floor for your lifestyle, decorating tastes and budget. Quality hardwood floors also deserve a quality installation and our trained installation crews will make sure your hardwood flooring is installed correctly - we guarantee it!